Towards the end of 2009 Activa released his debut artist album "This World". The producer who less than a year before had been described by Paul Van Dyk as the "Best Producer of 2008" duly delivered one of the best dance albums of 2009 and cemented his place amongst dance music's production elite. One of the features of the album was a series of collaborations with some of Activa's favourite producers and it is his collaboration with Vandit superstar Giuseppe Ottaviani that is the backbone of Discover's latest release which includes the original album version and a fresh new remix from Giuseppe. 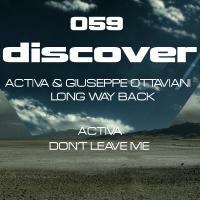 If that wasn't enough we have also included Activa's brand new "club" version of the album track "Don't Leave Me" which brings the release home in suitably uplifting style! 'Long Way Back / Don't Leave Me' is available now from Beatport and iTunes.